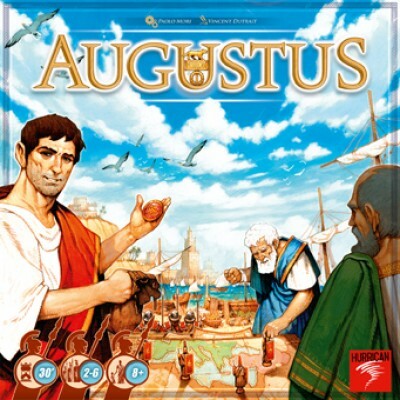 Augustus is one of this year’s nominees for the Spiel des Jahres (the largest board games award). 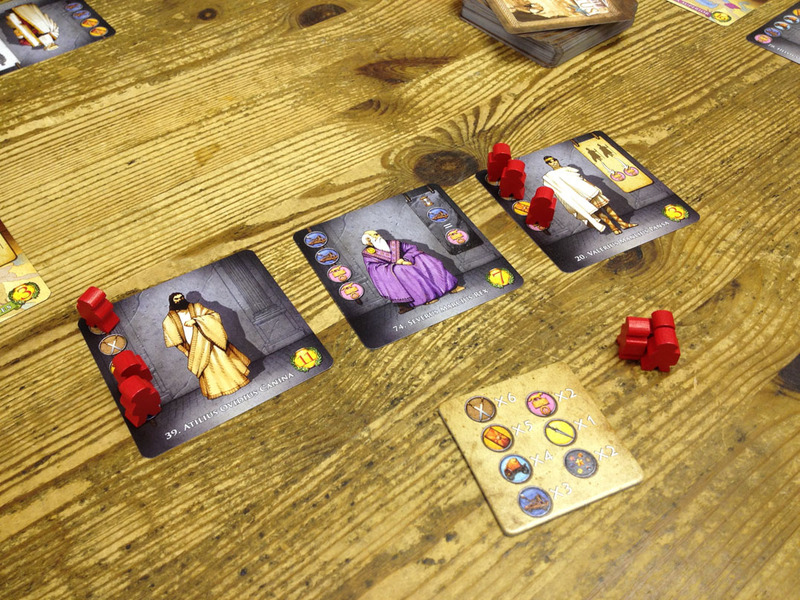 It is designed by Paolo Mori who designed Libertalia and (one of my favourite games) Vasco de Gama. In fact, Paolo seems to be designing more and more at the moment. Players always have 3 objective cards and each can be completed by placing one of their legions (meeples) onto each of an objective’s symbols (sword, shield, chariot, etc.) Each turn, one player (the town crier) randomly draws one symbol from the bag. Then, every player can place one of their legions onto a matching symbol if they have a vacant one on one of their objectives – the placed legion can be from their supply, or they can move a legion which is already placed on an objective. So, if a sword symbol is drawn a player can place a legion from their supply, or from another objective, onto an empty sword icon. There is a known mixture of symbols in the bag and there are more of some symbols than others, i.e. 6 swords, 5 shields, 4 chariots, etc. Therefore, whilst it’s a random draw, some symbols are more likely to be drawn than others. There are also 2 wild (joker) symbols in the bag – when one of these is drawn, players can place a legion on any one symbol, plus all of the previously drawn symbols are put back in the bag, and the town crier moves on to the next player. Objectives have very different mixtures and amounts of symbols on them which means some objectives are likely to be harder to complete than others, but these give a bigger reward when completed. Completed objectives often give a bonus effect – some are immediate (immediately place legions on specific symbols, add extra legions to your supply, other players are forced to remove some legions from objectives, etc.) and some are on-going (the player can use one drawn symbol as if it was a different symbol). When a player completes an objective, they shout ‘Ave Caesar’ and a few things happen before drawing more symbols resumes. The legions on the completed objective are returned to their supply, the player takes a new objective from the 5 on display, and the player claims any relevant VP tiles (see below). If more than one player completes an objective in the same turn, they are resolved in numerical order (as each objective has a unique number) and this can be very important. In the middle of the table are the VP tiles and the 5 objectives from which players can draw when they complete one of theirs. Each objective states what VPs the player will score if completed at the end of the game. In some cases, it’s a straightforwards number, whereas some earn VPs based on other factors, such as the number of green objectives they have completed, or the number of shield icons the player has on their completed objectives, etc. The mixture is nicely varied. However, there are also 3 other VP scoring mechanics which are VP tiles and these can be claimed by a player when they complete an objective. Some VP tiles can be taken by the first player to complete the mix of objectives shown on the tile, such as the first player to have completed 3 senator objectives, or the first player to complete 3 green objectives. Two VP tiles for the player who has currently completed the most gold or wheat objectives – however, if tied, the player who completed the wheat/gold objective most recently takes it so these can switch hands quite rapidly during the game. Finally, and the most entertainingly, there are five VP tiles for the player’s total number of completed objectives (one each for completing 2, 3, 4, 5 or 6 objectives worth an increasing amount of VPs). Each player can only ever take one of these tiles during the entire game and they must have the exact number of completed objectives when they do, i.e. if you’ve completed 4 objectives, you can only take the 4 tile if it’s available. This last category adds a very funny push-your-luck element – do you take a lower scoring tile so at least you have one but at the cost of potentially gaining a better one later, or do you push on at the risk that someone else might take the one you want first or the game ends before you get another chance to take one? The game ends when any player has completed 7 objectives and the player with the most victory points (VPs) wins. Overall, Augustus has a very simple game mechanic at its core but there’s a constant flow of you interesting decisions and almost no downtime. When allocating legions, you’re always considering which objective to complete first and how best to allocate your legions. Luck-of-the-draw is the central mechanic but it’s on you to make it work and to find, and complete, objectives that combine well. Also, you feel you’re able to mitigate the luck factor to some extent by making choices over what mix of objectives you are trying to complete, how to use the powers on them, etc. Player interaction feels quite high because all players are competing for the same VP tiles, plus this is magnified by there being almost no down time so it feels like a bit of a race. Also, a few objectives can affect other players. There was also a definite competitive atmosphere when completing objectives as players seemed to shout ‘Ave Ceasar’ as quickly as possible, even though simultaneously completed objectives are resolved in order of their number, not the order of shout. (One player went their own route and, instead of ‘Ave Ceasar’, shouted ‘Domus’ which is Latin for House – that’s an English Bingo pun). I think it’s always a good sign for a game if the players are more competitive than they need to be. One of my players said he had heard Augustus referred to as ‘Roman Bingo’. The phrase is actually quite a good summation of the core mechanic, but it understates the entertainment and gameplay within. If someone said to me, “Play this – it’s Roman Bingo,” I would have been very hesitant, but Augustus is much more than that. I can see why it’s an SdJ nominee (in fact, I think it will win for several reasons) and I’m looking forwards to playing it more with other groups too. I think the SdJ nomination has probably highlighted a game that could have gone unnoticed. 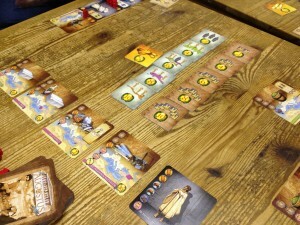 In the end, Augustus was a lot of fun with lots of interesting decisions to be made in what is a simple game. Yes, the core game mechanic is simple and can be compared to bingo, but there’s more to it than that with lots of variety in the objectives’ powers and scoring, and it’s this whole that delivers a complete game. I think light gamers as well as kids will like it just as much as being a quick game for serious gamers. 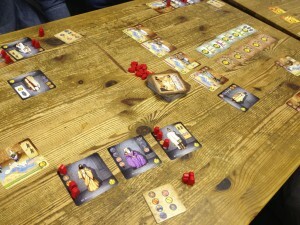 This entry was posted on Thursday, June 6th, 2013 at 11:26 am	and is filed under Augustus, Board Game Review, Board Games. You can follow any responses to this entry through the RSS 2.0 feed. You can leave a response, or trackback from your own site.